Citation Information: JCI Insight. 2017;2(17):e90874. https://doi.org/10.1172/jci.insight.90874. 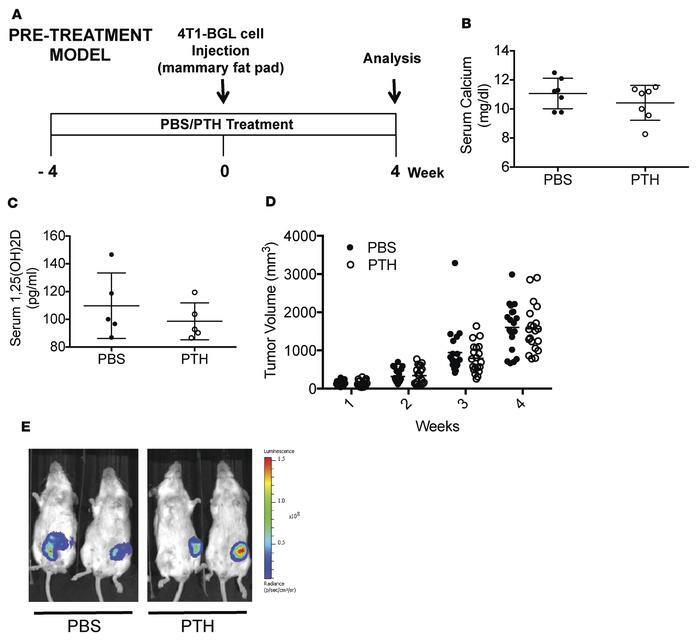 Pretreatment with intermittent PTH does not affect primary tumor growth in an orthotopic 4T1 murine breast cancer model. (A) Prevention model experimental design. Mice were 6 weeks of age at the start of the experiment and 10 weeks at the time of 4T1 cell injection. (B) Serum calcium and (C) serum 1,25 (OH)2D levels from PBS- and PTH-treated mice. (D) End point tumor volumes. (E) Representative bioluminescence images (BLI) of mice bearing 4T1 tumors pretreated with intermittent PTH. All values represent mean ± SD of n = 20 for each group.